A proper evaluation of the complex problems related to cataract surgery with toric IOLs requires high records of simple and complex cases, filtered by critical knowledge. For this reason we asked the opinion of Professor Ozana Moraru, who is well known even in Italy, as she has been speaker at many Italian ophthalmological meetings. Who is the patient of cataract refractive surgery in the second millennium: expectations, literacy, life-style? Nowadays the patients are more willing to be spectacle independent after their cataract surgery and moreover, they ask for this spectacle independence, even if they don’t have cataract – meaning that they require a refractive surgery solution for their ametropia. Because of these high expectations, the IOL industry and the refractive surgery, generally speaking, had to have a huge development in the last fifteen years or so. There are possibilities for the astigmatism correction, via a Toric IOL implantation, or for the presbyopia correction, via a multifocal or trifocal IOL, and for both presbyopia and astigmatism, via multifocal toric or trifocal toric IOLs and moreover, there are possibilities for refractive “fine tuning”, by using Laser technology to adjust post-operative unwanted residual refraction. For bigger refractive surprises, or for patients where the Laser corneal surgery is not a good option, there is the Add-on IOL technology developed in the last years, which helps in reaching the desired post-operative refraction, the Plano refraction. Thus, mastering all these new devices and tools, the surgeon is able to offer to his/her patients, complete spectacle independence, which is so required nowadays, when patients are more and more demanding, according to modern lifestyles. Mini-incision and preloaded injector: what is their importance for the surgical outcomes? The smaller the incision, the less the induced astigmatism, but is there an inferior limit? Practice and studies have shown that an incision smaller than 1.8 mm does not really influence the astigmatism. So, it is not really important from induced astigmatism point of view, to perform an incision smaller than that. On the contrary, the bigger the incision, the bigger – and, in the same time, the more variable – influence on the induced astigmatism. requirement in toric IOL implantation, for a very good post-operative refractive outcome. 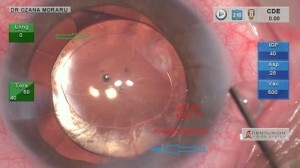 In the same time, even without a toric IOL implantation, MICS cataract surgery insures safer surgical profile: working in a close system, you have better stability during surgery (in terms of anterior chamber depth, IOP, posterior capsule stability) and, in the same time, there is less risk for intraocular infection. But again: the incision should not be that small, that it is forced and enlarged during the surgery or during the IOL implantation, putting at risk the IOL integrity and/or the safe incision closure with self healing, with the need for suture, at the end of the procedure! One or more sutures on the incision will determine a big astigmatism and will completely disturb the initial calculations concerning the emmetropic target, because the SIA is very high and unpredictable in these cases! Preloaded IOLs are much safer from this point of view: no manipulation of the IOL and no contamination of the IOL. In my practice I noticed that there is a small learning curve in their implantation, with some insignificant issues in the IOL delivery in the AC, but also with some enlargement of the incision done by the implantation itself. Ph. 1-2: Two different toric IOLs blocked in an 1.8 mm incision, leading to incision traumatic enlargement, with increased and incontrollabe SIA and maybe lack of self-sealing at the end of the procedure, needing for suture. For example, we shall present at the ESCRS Congress in Copenhagen a paper with a comparison of implantation of AcrySof IQ IOL (Alcon) with three different devices (Cartridge type “D” in a Monarch injector, Autosert System and Preloaded Ultrasert System), where we compare three parameters: easiness of implantation via wound assisted technique (with possible complications during implantation), duration of the implantation and enlargement of the incision by the implantation itself. It seems that, at least in my hands, the preloaded AcriSof IOL system (UltraSert) enlarges a bit more the incision, and this observation and result can be important when we target the emmetropia, especially for the preloaded Toric IOLs, where we shall need to modify the Surgical Induced Astigmatism (SIA) Vector value in our toric calculation. But, despite the initial learning curve and some incision enlargement, I think that the preloaded IOLs are safer for the surgery outcomes, at least from the safety reasons, due to lack of IOL manipulation. Ph. 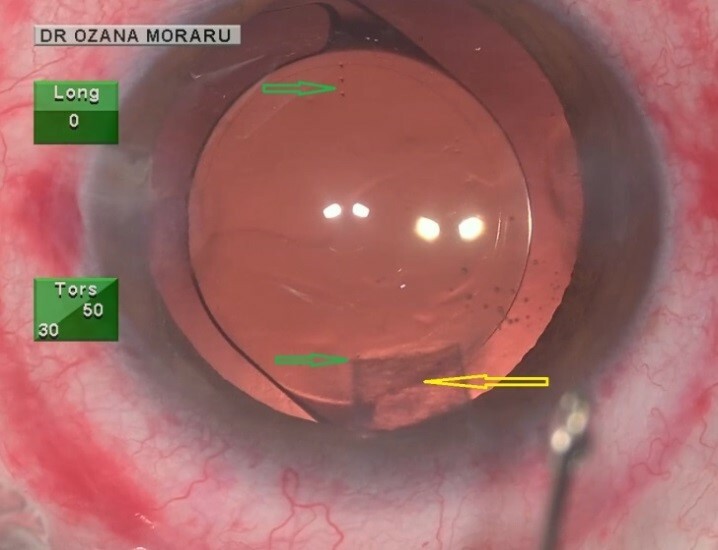 3: A femto-cataract procedure, where , despite the perfect incision done by the FemtoLaser (yellow arrow), its lack of transparency impair a bit the toric IOL markings in that zone (green arrows). – the first opinion is to make the incision where the surgeon finds it more comfortable, and write it down when planning in the Toric Calculator, so the resulting calculation will take into consideration the incision location and will give a T result accordingly. – the second opinion is to make it Always temporal, because the incision on the same axis determines a SIA always of the same value (more or less) – so it is more precise and very easy to be known – and because the SIA is minimized on the temporal axis: as it is already known, SIA and incision flattening effect are lower in the temporal approach than in the superior one (with about 50%), due to the different radius lengths of the cornea, on the horizontal and vertical axis; moreover, a superior incision is closer to the visual axis, in comparison with a temporal one, thus magnifying its flattening effect. Ph. 4: Eye with previous Radial Keratotomies: the superior toric markings (red arrow) are difficult to be seen, in comparison with the inferior ones, because of the main incision, situated in the same place (blue arrow); RKs and anterior capsule epithelial cells increase the difficulty of the IOL markings visualization. – the third opinion is to make the incision always on the steepest axis, because that approach will always diminish the astigmatism; the disadvantage is the fact that in this case, the surgeon needs to know his own SIA on all the meridians, which doesn’t happen usually. 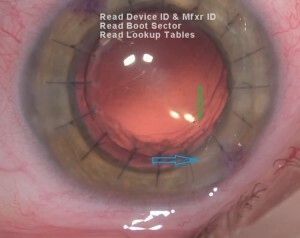 On the other hand, from technical point of view, it seems to be a good idea to avoid planning the main incision on the same meridian with the IOL toric alignment, because the corneal changes during the surgery or at its end (such as localized edema) at the incision site can impair the good visualization of the toric IOL markings in that zone. Thus, when the toric calculator gives us a toric alignment under the incision site (Fig. 3-4), we should change the incision location in the toric calculator (but before the surgery, in the planning time, not in the OR! ), with 5-10 degrees from the proposed IOL toric alignment; this, of course, will influence the induced astigmatism due to corneal changes. But the toric calculator will change accordingly the toric alignment axis and even its value (Fig. 5). Ph. 5: Eye with previous Penetrating Keratoplasty, where the main incision (blue arrow) has been correctly planned and done a bit apart from the IOL toric marking (green arrow) – thus, the marking is easily visible. My personal preference is to make the incision Always on the steepest axis when I have non-toric IOLs and always on the same axis, when I have Toric IOLs: superiorly, at 100 degrees, where I am most comfortable. In this case, I choose the toric IOL with a greater astigmatism correction (overcorrection), to compensate the more induced astigmatism in superior approach. As a general rule, taking into consideration not only the more induced astigmatism in superior approach, but also the against-the-rule effect of the ageing, I under-correct with one T step the result in with-the-rule astigmatisms and overcorrect with one T step the against-the-rule astigmatisms. There is only one exception, in terms of incision location: in very high astigmatism, which needs a high toric value of the IOL, a value that exceeds the toric availability on the market, or in cases of lack of “right away availability”, I do some tricks, in order to enhance the toricity effect of the IOL: by making a bigger incision (plus/minus an opposite full thickness incision 180 degrees apart), of about 2.8-3.5 mm, done on the steepest axis, so I can flatten more that axis, thus enhancing the effect of the toric IOL in the treatment of the astigmatism. I also perform the incision tunnel shorter in the cornea, so its flattening effect is even bigger – depending on the value of residual astigmatism after the toric IOL effect, that needs to be corrected more. 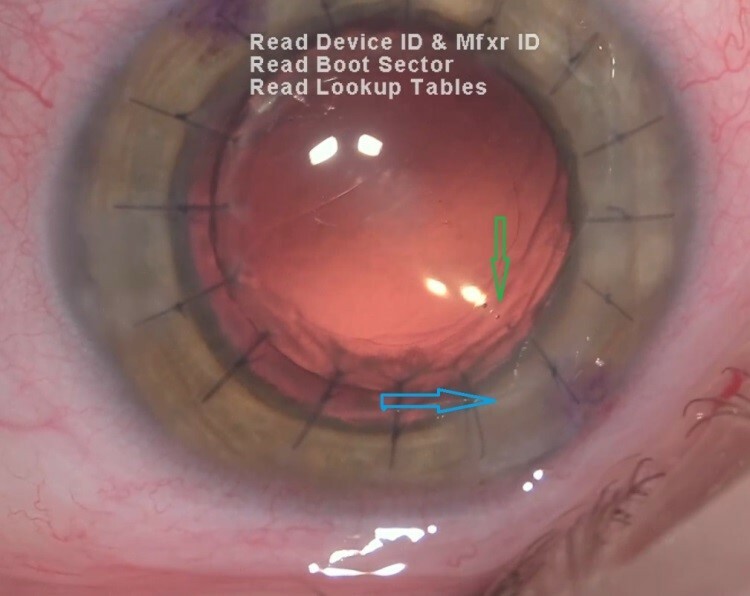 Of course, the incision enlargement effect is not as accurate and precise as a toric IOL effect, but, with experience, the surgeon should and can anticipate his/her SIA for larger incisions, such as 3.0-3.5 mm. Unfortunately, in this case, we don’t have anymore the advantage of a MICS incision in terms of safety from contamination point of view, so extra-care should be taken on this matter. Why is it better to refer to the Flattening Effect of the primary incision instead of the whole SIA for IOL power calculation? The limit of SIA is that it depends on many factors and the surgeon must know these factors and adjust the own SIA accordingly: the size, the location, the architecture of the incision, even the corneal radius on a certain meridian, the cornea thickness, the corneal elasticity, and also the surgical technique, the type of cataract (especially the nucleus hardness) and the dioptric value of the IOL to be implanted. Among all these, the most important factors are the incision length (the longer the incision, the more induced astigmatism), the incision location (on temporal meridian it induces less astigmatism than in the superior one) and the incision architecture – the shorter the tunnel towards the center, the more flattening on that meridian and more induced astigmatism and the longer the tunnel, the less flattening on that meridian and less important corneal changes. Moreover, when calculating a Toric IOL, the corneal changes are produced not only on the incision meridian, but on the opposite 90 degrees apart, as well: the incision creates a flattening on the meridian where it is done, and, in the same time, it will create a steepening on the other meridian, 90 degrees apart (coupling effect). SIA vector has two components: the flattening and the torque; the first one, the flattening effect, is the one which in fact reduces the astigmatism, while the torque has no effect on the astigmatism value (so, no reduction on the incision meridian), but it changes only the orientation of the astigmatism (as reported in the article of: Borasio E, Mehta JS, Maurino V. Torque and flattening effects of clear corneal temporal and on-axis incisions for phacoemulsification. J Cataract Refract Surg. 2006 Dec;32(12):2030-8).